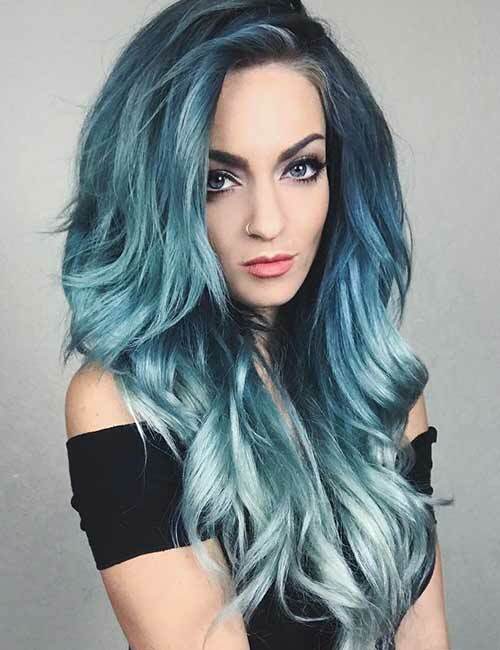 Mermaid hair has been trending since last year, and in my opinion, it is one of the best things to have happened to hair coloring. 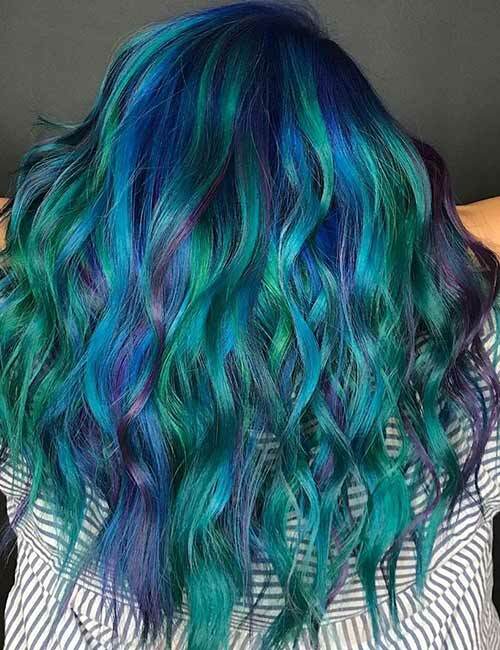 From the vivid hues to the flawless blending, all mermaid styles are unique, and each one is a piece of art. The best part being, there is something for everyone. 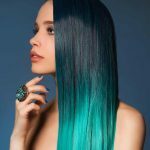 Following, We’ve put together, a list of 25 gorgeous mermaid hairstyles but first, let’s look at how you can go about getting the look. Ensure that your hair has not been washed in 2-3 days. The oils in your hair will help with the lightening process. Brush out your hair to get rid of any tangles or knots. Wear your gloves and apply the petroleum jelly along your hairline on your forehead, neck, and ears. Following the instructions on the kit, mix your bleach. Section away the crown part of your hair and as per the instructions on the kit, apply the bleach onto the loose hair with the applicator brush. Once you’re done with the bottom sections, undo the sectioned away the top part of your hair and repeat the application process. Leave the bleach on for the recommended duration of time and then proceed to shampoo and condition your hair. Note: You might have to repeat this process a couple of times to achieve the desired lightness. 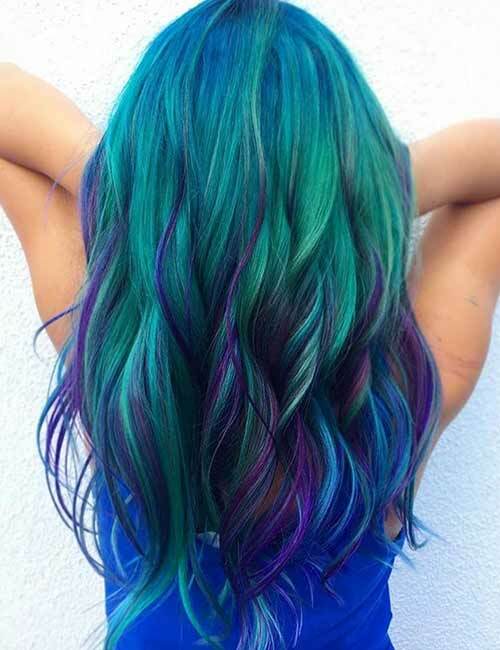 Once you’ve pre-lightened your hair, pick some mermaid colors of your choice. Ensure that your hair has been freshly washed and conditioned. Start applying the dye onto your lightened hair in sections. 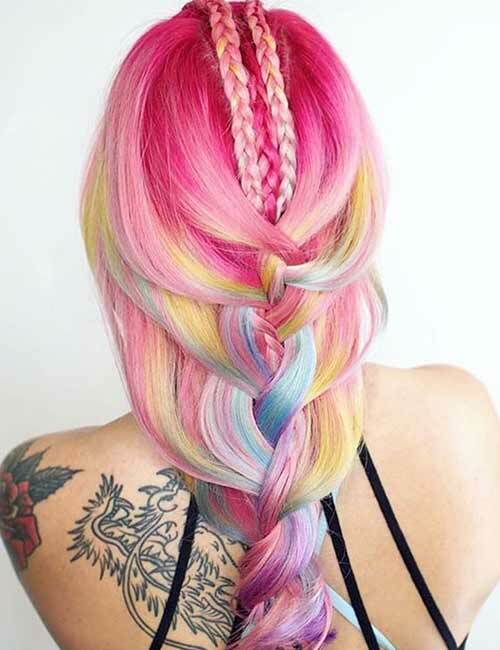 You can paint random strands with different colors, or you can use one or multiple colors to create an ombre effect. Once you’ve applied the dye, wait for 30 minutes. Wash your hair with a color protecting shampoo and conditioner. The gray hair trend is never going to die, and in combination with mermaid hues, this look is absolute perfection. The dark black roots have been expertly blended out to a beautiful aqua which then seamlessly transitions to a beautiful gray. If this is what real mermaids look like, give us a pair of binoculars and leave us stranded at the beach. These beautifully long beach waves have evenly taken color to create a flawless aquamarine look. If you love aqua colors, there is no way you won’t fall head over heels with this style. Who doesn’t love a Victorian mermaid? This style has been perfected with lavender, pink, and ruby tones that add dimension and volume. This style incorporates vivid ruby hues near the crown section which melt into a pink and then to a lavender, and you move further down the layers. Could the name for this style be apter? 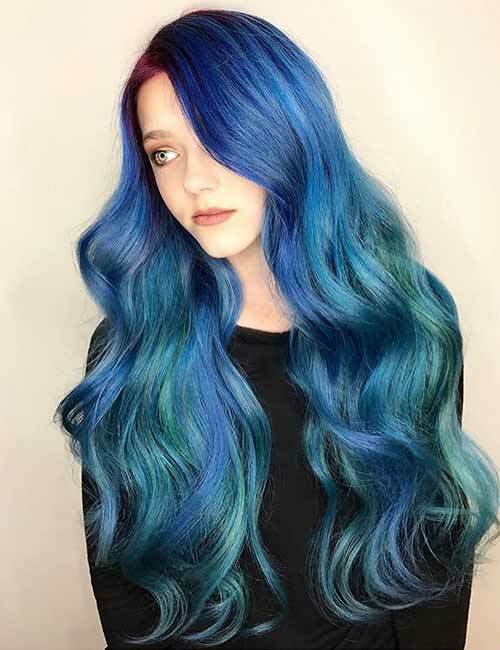 With colors that were picked from the depths of the ocean, this hairstyle is one of the best mermaid looks that we’ve come across. 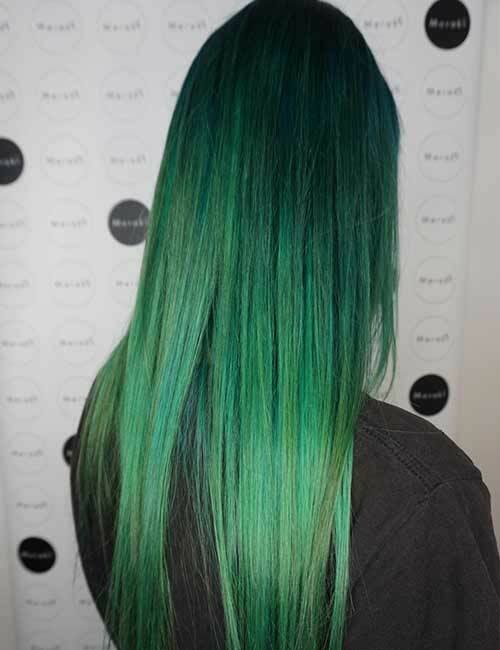 The deep blue roots fade to an aqua with electric green streaks that add movement. The style then picks up color again, transitioning to a deep berry blue at the tips. This style is, no doubt, a deep-sea masterpiece. 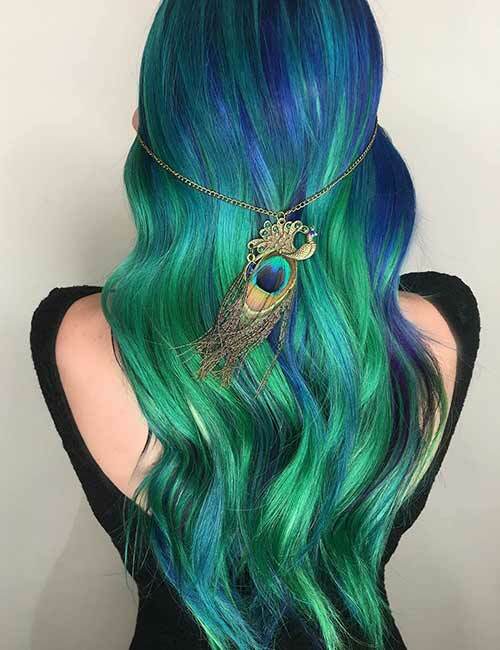 We love green hair, especially in this style. The black to silver-gray roots pick up a phantom green creating a balayage effect. The style is dimensional and creates enough volume to be perfect for women with medium-length fine hair. Talking about fine hair and creating dimension, this style has nailed the concept. With a deep green at the roots that fade out at the tips, this hair color looks phenomenal. 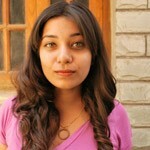 The best part is that you won’t have to lighten your hair too much to achieve this look. The natural yellow tones add dimension and look beautiful when weaved into the green. A foreign mermaid princess who loves peacocks? Sounds pretty apt. With tones of jade, teal, and royal blue, this style is nothing short of perfect. The multi-toned locks help create movement, making this style perfect for women seeking volume. A lot like the previous style, this one too incorporates multi-colored streaks. The style has incorporated a pop of purple, adding so much dimension to this multi-hued look. The beach waves just help tie the whole look together, making it one of the best mermaid styles we’ve laid our eyes on. This mermaid style is so badass with its storm-like color scheme. 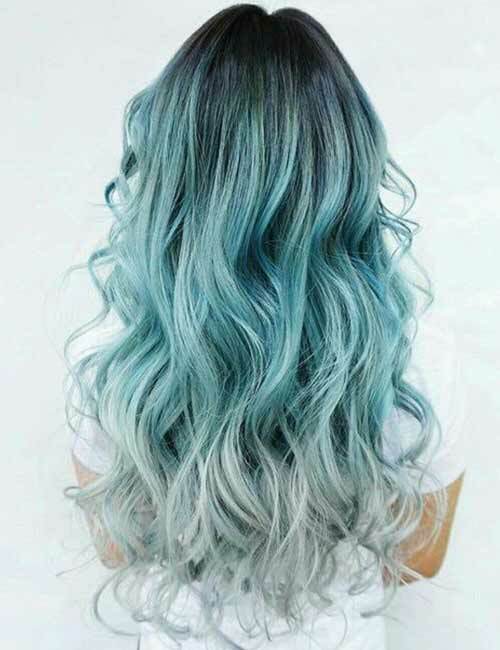 The dark roots fade to a denim blue which takes on silver tones at the tips. The style is bold, beautiful, and badass, all at the same time. 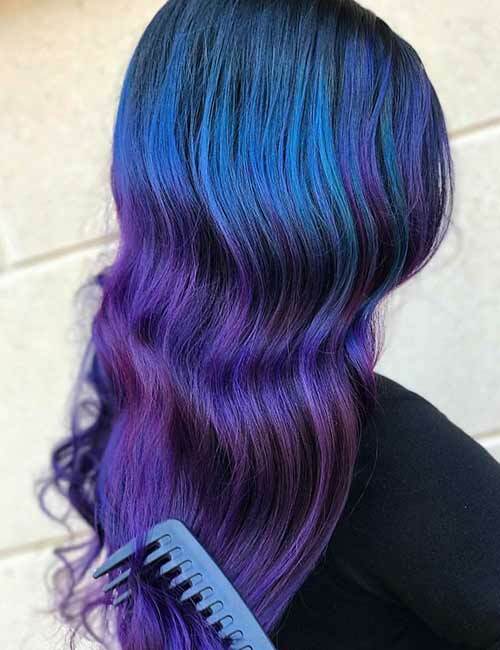 We love our perfect platinum, but this style has taken the look to a whole new level by incorporating shades of blue and purple in the lower layers. The peekaboo colors help add depth to the style, reflecting perfectly the colors of the ocean. The moonlight glinting off the waves of the ocean during the darkest hour of night. That’s what this style looks like to us. We can’t stop ooh-ing at this perfect blue balayage. This style is sure to suit all hair types and textures. There’s no way that this mermaid does not have an ear for grunge. 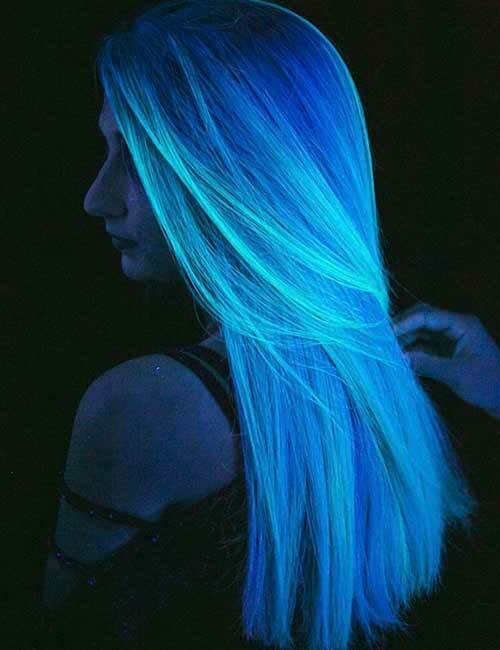 This absolutely badass hairstyle incorporates capri blue hues at the lower lengths of the hair. The balayage has been painted on perfectly to add subtle texture, and we are in love. This blue haired mermaid is just nailing the look. From the Purple roots that melt into the deep ocean blue to the subtle fade as your eyes travel down the length of her locks. 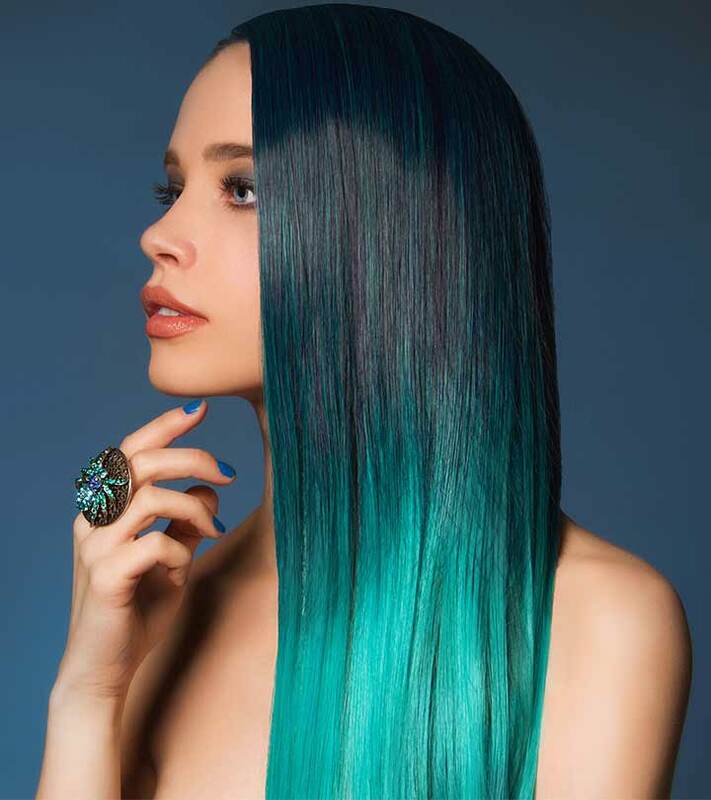 The hairstyle takes on teal tones in the mid-lengths. 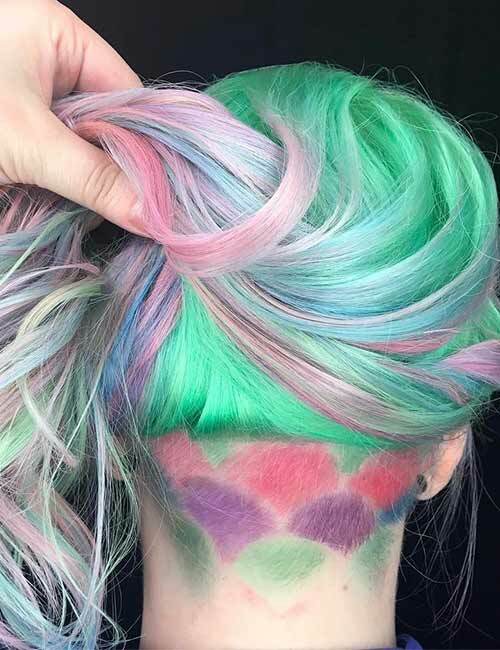 This look is sure to look as good fading out as it looks freshly colored. If simplicity were an art, this hairstyle would be one of the best masterpieces that we’ve had the pleasure of appreciating. 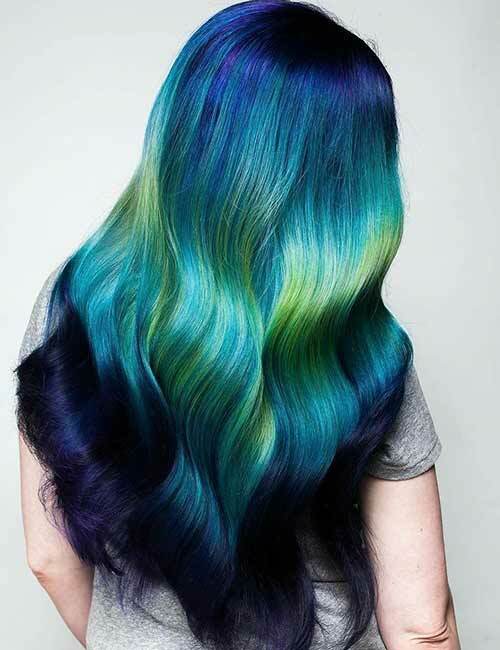 The dark roots seamlessly melt to a deep aqua blue that further fade to a lighter aqua. The vivid color is perfectly adorned by seashells. What accessory could be more fitting? WE LOVE THESE NEW GLOW-IN-THE-DARK shades. While they look like regular vivid colors with the lights on, they turn into magnificent sources of luminance when the lights go off. Can you picture this mermaid swimming in the ocean with her gloriously glowy mane? Ooh, this vibrancy. 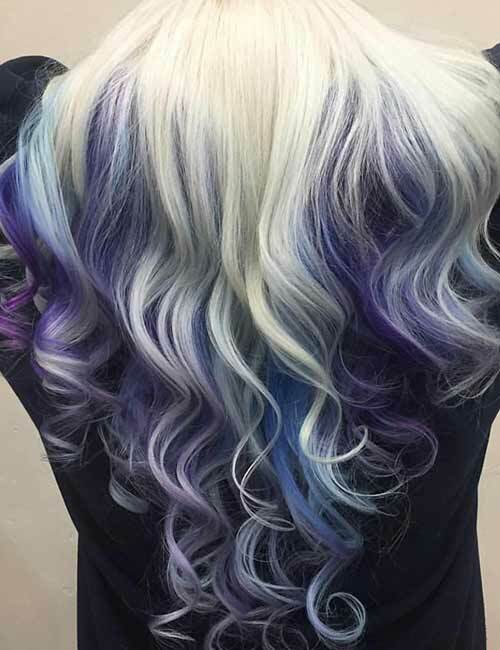 With dark roots melting into vivid blues and purples. The artist has created the perfect melt near the roots which then progresses into the perfect purple balayage as you move down to the tips. This magical deep ocean blue is so simple yet so stunning. 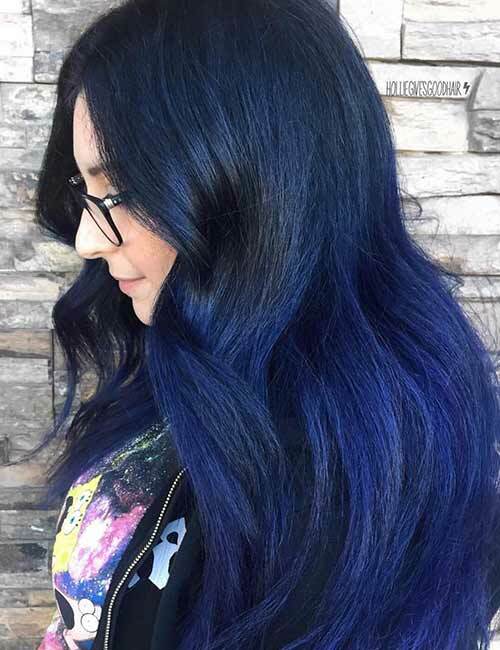 With dark black roots that flawlessly melt to blue, this style is absolutely gorgeous. 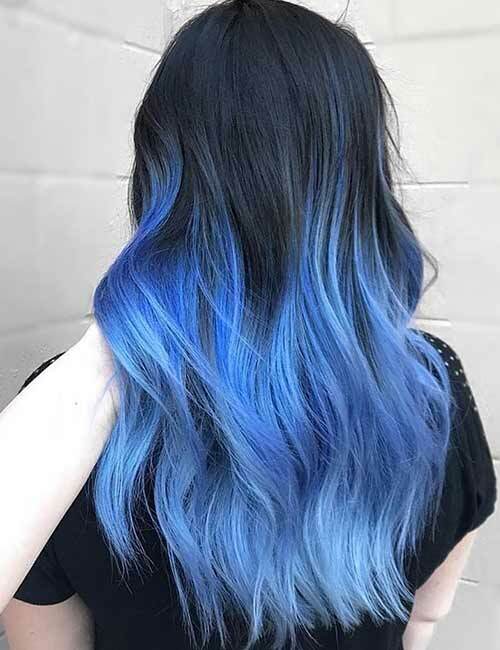 The style incorporates an ombre effect where the dark hair fades to a light yet vivid blue. This style has so much going on and in all the right ways. This is one of the most perfect combinations of natural and unnatural colors that we’ve come across. 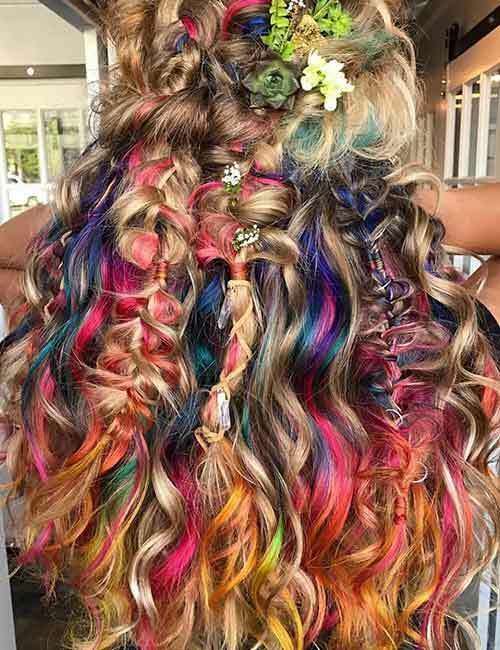 The style has shades of dirty blonde, dirty brown, blue, aqua, pink, orange and some yellow and green neons. The artist has to be a true genius to have pulled the look together so well. This style is pastel perfection and one so gorgeous, nobody can deny it. 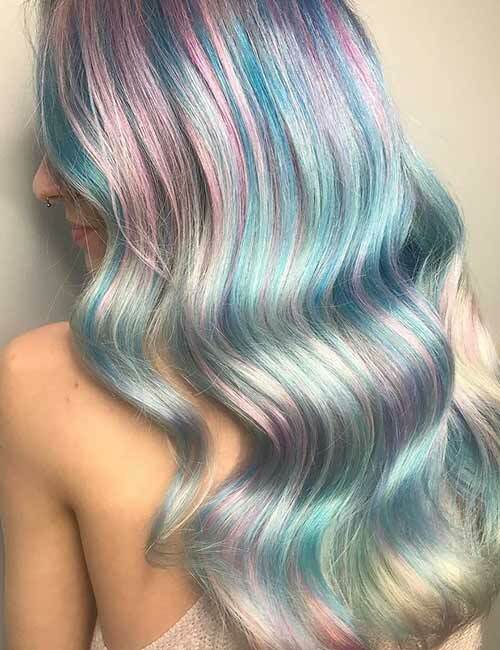 With pastel tones of pink and blue painted on platinum hair, this is one of the coolest styles (pun intended) that we’ve come across. Lovers of cool tones, this one’s for you. Ariel is definitely our favorite Disney princess, and we can say with conviction that this has to be Ariel because nobody else has red locks this gorgeous. 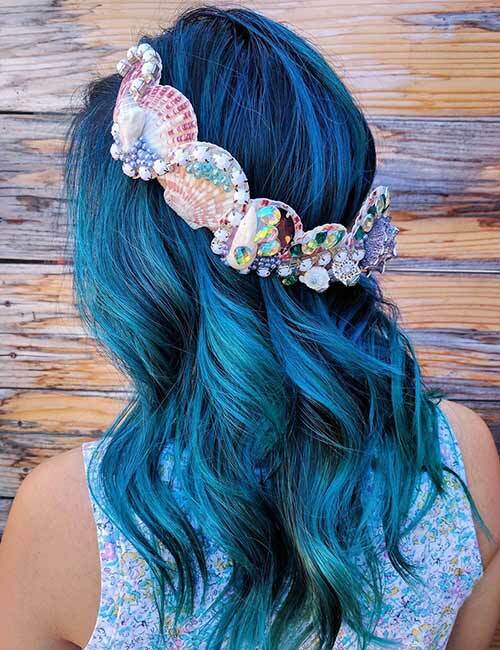 This single-toned mermaid style has been styled to perfection. The color has taken to the hair so evenly, it almost looks fake. In the best way possible, of course. As the saying goes- Always be yourself. Unless you can be a mermaid. Then definitely be a mermaid. This beautiful style has pastel shades of green, blue, pink, and purple. 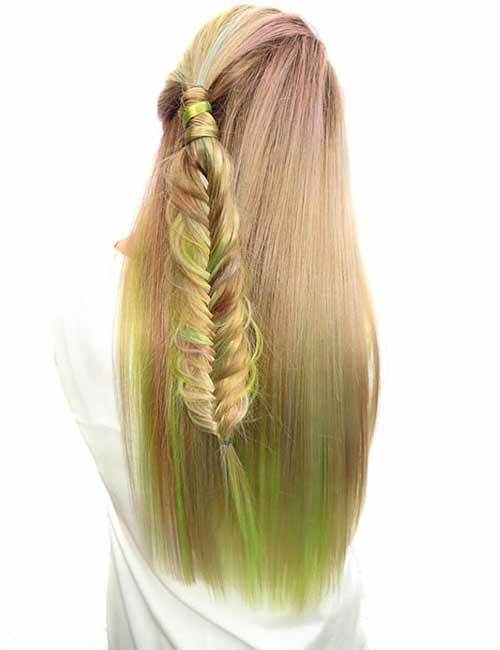 The fish-scale undercut ties the whole look together, making this mermaid perfect. Are you a mermaid who loves pink? Then it definitely can’t get better than this for you. The deep pink melts into a multi-hued pastel balayage, and the outcome is truly glorious. And we cannot deny how beautiful these colors look on braided dos. What’s more breath-taking than relaxing in crystal clear waters? This hairstyle. 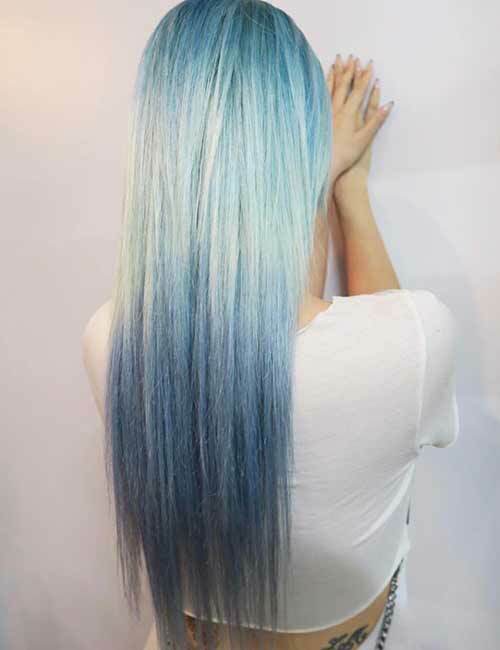 The style starts off with aqua roots that soon melt to a gorgeous platinum. The mid-lengths start to take on a gorgeous ash-blue color near the ends. It is so easy to go wrong with adding movement at the mid-lengths, but this style is all things right. If you love subtlely, this might be the style for you. The artist took a loud neon green and created a balayage so well done that the result is anything but loud. 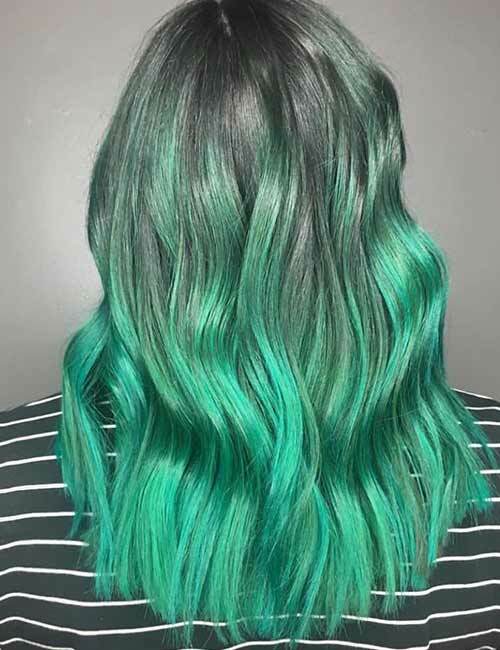 The dirty blonde, in combination with the green, is the best subtle mermaid balayage we’ve laid our eyes on. Mermaid hair looks like it’s here to stay. If you’re feeling inspired, now is the time to spruce up your hair and transform into the mermaid goddess that you really are. Which of these styles stole your heart? Let us know in the comments section below. Amazing hair trends keep us alive. And cotton candy hair color has us bursting with life. 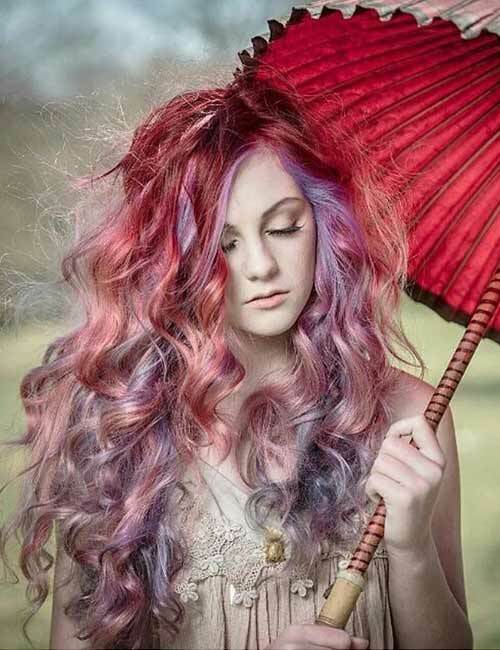 We’ve put together, a list of 20 of the yummiest cotton candy hairstyles that we’ve come across.